Those of us in the marketing business already knew that it's not a good idea to make Joseph Jaffe mad. He's one of those people who has all of the tools at his disposal to spread bad news about a brand (and good news), virally. If you want to see what I mean, check out the video above, which he, of course, posted to YouTube, posted to his Jaffe Juice blog, and has tweeted to his more than 13,000 followers. I'd be surprised if American Express hadn't noticed this by now. Someone told me recently that the wonderful world of retouching has come to high school graduation pictures, and I guess I shouldn't be surprised. Being retouched to a fare-thee-well is now in reach of everyone! Even your 16-year-old who doesn't need it! 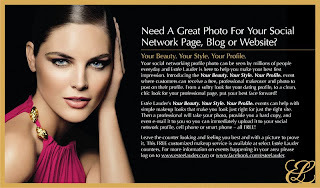 So, in this era of Photoshopping for the masses, it shouldn't be surprising — but is nonetheless a great idea — that Estee Lauder is about to bring a similar thing to the lowly social networking profile picture, while promoting itself to boot. According to Ad Age, the cosmetics company is now offering free makeovers and photo shoots for Web site profile pictures in a select group of department stores, such as Bloomingdale's New York, that carry its brand. The only "cost" for those who do it is having an Estee Lauder logo in the background on the picture, which to me seems like a minimal bother given how expensive it is to hire a makeup artist and photographer all by yourself. The brand is promoting it on its Facebook page, though the pictures themselves can appear wherever women in Estee Lauder's 35 to 55 year old target roam online. So, will there be retouching? A little. Estee Lauder spokesperson Tara Weisenberg described it as "minor." Damn. When: Oct. 8, 7 p.m. to 9 p.m.
To register, go to this link and scroll down to the course titled, "Blogging Boot Camp and Twitter Too ... " or contact Lynda LaMonte Garmong at lynda@thebetterclass.com. Thanks all. Now back to coverage of advertising. So, I'm reading tonight about the decision by ANDY Award co-chairs Ty Montague and Michael Lebowitz (JWT and Big Spaceship, respectively) to crowdsource the jury, actually a kind of obvious step when you think of where things are headed -- to one big crowdsourcing of everything, from advertising ideas to what to have for lunch. So what the hell, go to electthejury.com and cast your votes. Among other things, what the duo is hoping for is: "a more accurate, fair snapshot of what has been done in the past year," according to Montague. I'm not sure about that. 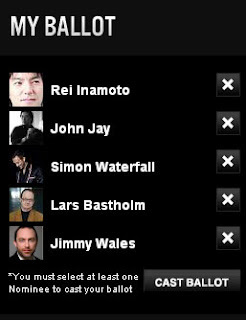 I stuffed my ballot box with AKQA's Rei Inamoto, because he has such a cool name; John Jay to fill the Wieden + Kennedy requirement; Simon Waterfall, because he just left his agency and doesn't have much to do; Ogilvy's Lars Bastholm because he's Lars Bastholm; and Jimmy Wales because if he ever sat for an advertising awards show I'd plotz. The story about all this in Adweek of course led some advertising types to speculate about creative directors at big agencies getting their minions to vote early and often, thus skewing the jury, and ultimately, of course, the awards. Ah the cynicism.C'mon, I checked the site out and you can only vote once ... per day. It occurred to me that what Montague and Lebowitz really ought to do is eliminate the jury entirely and just crowdsource the entire show. You know, cut out the middleman.